The Medicine Lake Highlands, northeast of Mount Shasta, are sacred to the Pit River, Modoc, Shasta, Karuk and Wintu. The Pit River people believe that the Creator and his son bathed in the waters of the lake after creating the earth, and the Creator imparted his spirit into Medicine Lake. The water has power to heal and to renew, and the area around the lake is used as a training ground for medicine men from the coast to the Rockies. A coalition of tribes petitioned the National Register of Historic Places to recognize the Medicine Lake Caldera (an oval crater within the highlands) as a Traditional Cultural District in August of 1999. The subsequent recognition of the Medicine Lake Area Traditional Cultural Places District caused one of two proposed geothermal projects to be rejected by the U.S. Forest Service and the Bureau of Land Management in 2000. However, in November 2002, the Bush Administration scrapped those protections and approved a $120 million, 48-megawatt geothermal power plant at Telephone Flat, one mile from Medicine Lake. In the mid-1980s the BLM sold geothermal energy development leases to the Medicine Lake Highlands to three corporations for $10.6 million without any consultation with local tribes that use and revere the area. By 1998, all but one of the leases had expired and no actual development had occurred, though a draft environmental impact statement had concluded that geothermal development would have “adverse impacts.” In spite of that finding—and President Clinton’s Executive Order 13007 on sacred sites—the BLM renewed the expired geothermal leases for 40 years. The entire Highlands area has not been fully evaluated by the National Register. This means that the U.S. Forest Service and the Bureau of Land Management were able to approve the first proposed geothermal project in an area known as Fourmile Hill (just a quarter of a mile outside and to the north of the designated Traditional Cultural District) to tap its geothermal energy. Calpine Corporation is now drilling exploratory wells at Fourmile Hill, intending to harness steam power to run as many as six power plants. The Pit River Tribe and the Native Coalition for Medicine Lake filed an appeal with the Department of the Interior’s Board of Land Appeals, which resulted in a halt to exploratory drilling, but in April 2001, the Board lifted its Stay Order and drilling resumed. In addition, the Bureau of Land Management reversed its five-year moratorium on further geothermal development, inviting new drilling permit applications. The situation is made more complex by a split among area tribes concerning their highest priorities for tribal well being. In the case of the Shasta, the tribe has been fighting for federal recognition since the 1980s, a status that would entitle them to government services and funds. Calpine has offered financial support and office equipment to aid in the Shastas’ lobbying of the Bureau of Indian Affairs. Calpine has also promised college scholarships and jobs to local tribal members. Such support is difficult to turn down when tribes have pressing needs, and the differing opinions of tribal members have led to the formation of two separate tribal governments. While the Pit River tribe is united in its opposition to the Calpine project, the Klamath and the Modoc have promised they won’t interfere. As long as tribes feel they have to choose between much needed financial support and preservation of cultural sites, it will be hard for tribal governments to unite against industrial threats to their land. Money talks. The continued fallout from the perceived energy crisis in California makes Medicine Lake an urgent site for protection. Tribal practitioners consider any drilling to be a desecration of the sacred ground, in addition to the fact that the 100-foot tall power plant would be a domineering visual presence and source of noise pollution. From a scientific point of view, geothermal power is touted as a “clean” and “green” source of energy, but digging in the ground gives rise to dangerous chemicals such as arsenic, chromium, boron and hydrogen sulfide. The scale of drilling may lead to contaminated water, polluted air, disturbance of wildlife and damage to plants used for food and medicine. In addition, the energy generated by the Calpine power plant, while originating in California and subsidized by the California Energy Commission, has ironically already been contracted to the Bonneville Power Administration and will be exported and sold out of state. 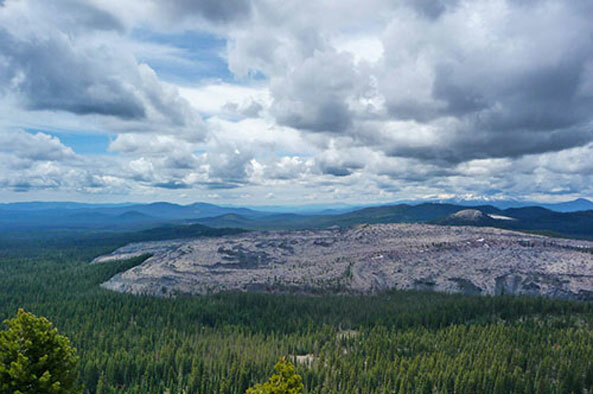 The Native Coalition, the Pit River tribe, and the Mount Shasta Bioregional Ecology Center are fighting approval of drilling and power plant construction on both local and national levels, and are supported by the Sierra Club and the California Wilderness Coalition. They filed a lawsuit in May 2004 arguing that the BLM renewed the leases without taking previous reports into consideration or consulting with tribes. Meanwhile, Calvert Asset Management Company issued a resolution requesting that Calpine “cease and desist development in the Medicine Lake Highlands” and develop a company policy on the rights of indigenous people by September 1, 2004. This resolution is part of a movement working to place responsibility for protecting sacred places on corporations, not just the government. In February 2013, a unanimous Pit River Tribal resolution opposed geothermal activity in the area, in particular Calpine’s proposal to introduce a new utilization plan to develop five 100-megawatt power plants in the Medicine Lake Highlands. “Medicine Lake is our church. It is there we heal our bodies and our spirits. Would you want a power plant in your church?,” said Cecelia Silvas, Ilmawi Band Elder in a statement. Ultimately, the entire Highlands area should be granted the status of a Traditional Cultural District and no industrial activity should be allowed in the vision questing and medicine gathering area. “Calpine’s Quest for Power.” San Francisco Chronicle, March 5, 2001. “Geothermal drilling near ‘sacred’ lake gets Bush OK.” San Francisco Chronicle, November 27, 2002. Pit River Tribe v. USFS. Pit River Nation’s supporters’ press release, Nov. 6, 2006.